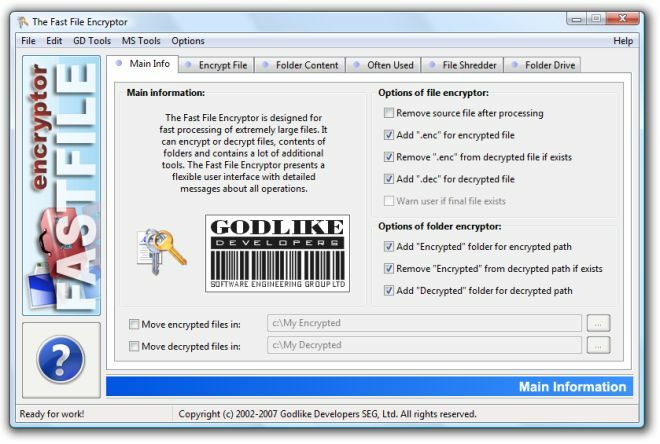 ﻿ Fast File Encryptor - software tools for MS Windows. "The Fast File Encryptor" is designed for fast processing of extremely large files. It can encrypt or decrypt files, contents of folders and contains a lot of additional tools. The Fast File Encryptor presents a flexible user interface with detailed messages about all operations. The Fast File Encryptor features the following tools: Encrypt File, Encrypt Folder, Often Used Files, File Shredder, Folder Drive.